Are you ready to become a member of WPI’s vibrant community of fraternities and sororities? Joining is easy—here’s everything you need to know. Be sure to check out the calendar and events listings for important dates and deadlines. What is required to join a fraternity or sorority on campus? First year and transfer students must successfully complete a term at WPI passing at minimum 2/3 of their A-Term courses. Students taking the semester-long math course must have earned 2/3 credits, not including the semester-long course, as no grade will have been earned in the course at the time of Formal Recruitment. Upperclass students must have passed an average of 2/3 of their courses and must be in good standing academically. There are several information sessions that occur during A-Term. It is recommended that interested students attend an event or session to learn more about fraternity or sorority life on campus. Take a tour of the fraternity or sorority houses, where you’ll meet members and learn more about the chapters. Fraternity New Member Recruitment begins the second week of B Term and continues through December. If you have any questions regarding Fraternity Recruitment or require accessibility support, email the Interfraternity Council (IFC)’s VP of Recruitment Chairman Leo Grande or IFC Advisor Caitlin Donlan. Formal Sorority New Member Recruitment begins Sunday, October 28 and ends on Bid Day on Friday, November 2, 2018. If you have any questions regarding Sorority Recruitment or require accessibility support, please email the Panhellenic VP of Recruitment, Elsa Luthi, or the Panhellenic Advisor, Christine Kobza. Women interested in participating in sorority recruitment must register on Campus Director. Registration will be available at the end of A-Term. How do I decide which recruitment process to participate in? 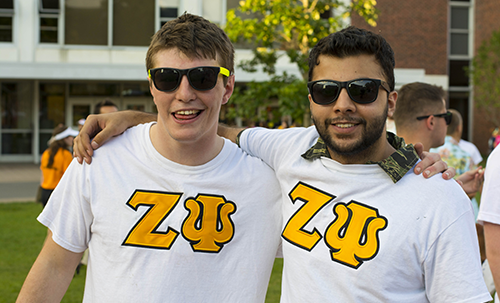 WPI is fortunate to have 13 fraternities and 6 sororities. The Interfraternity Council (IFC) oversees recruitment for the 13 fraternities. The Panhellenic Council oversees recruitment for 5 of the 6 sororities. 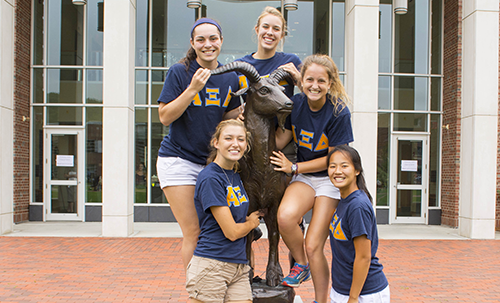 WPI's sixth sorority on campus participates in a process similar to recruitment entitled Intake. The chapters that participate in each respective recruitment/ intake process are listed below. Students should participate in the recruitment for the gender with which they identify. How do I decide which chapter to join? Each person looks for different attributes in a fraternity or sorority. Look carefully at all chapters and evaluate which best complements your values and personality. Join the organization where you feel most comfortable. If your are having trouble with your decision, your recruitment leader (fraternity recruitment) or Rho Gamma (sorority recruitment) are great resources. Can I join after my first year at WPI? Any student who meets WPI's academic requirements is eligible to join a fraternity or sorority regardless of class year. If you participated in recruitment the year prior and decided to revisit membership as a sophomore, junior or senior, you are more than welcome! Do members have to live in the house? Sorority and Fraternity housing is one of the multiple locations that WPI fraternity and sorority members may elect to take advantage of during their time at WPI. Each chapter has their own method to decide who lives in a chapter facility for the year. These chapter houses are owned and operated by the chapter and over overseen by a chapter House Corporation that consists of alumni members from the class of 2012 to 1962. Chapter housing selection begins in February and coincides with the university housing selection process. Should questions arise about costs, room selection or life in the house, the chapter president will have information to be able to answer any and all questions you may have.